Dazzle your guests with the alluring fixtures in Arthur Court's Antler Bamboo Cheese Set. A detailed antler adorns the left side of the board, its shimmering aluminum mixing beautifully with the soft color of the bamboo. 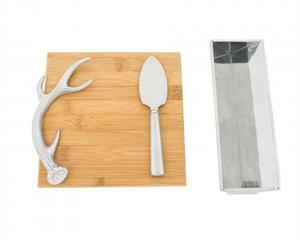 The horn and cheese knife, both handcrafted and sand-cast, come included in the handsome set.